The weeks between September and mid-November are a bountiful time for book releases, with new works from Alan Moore, Connie Willis, Christopher Priest, Ken Liu, Margaret Atwood, and Fran Wilde, to name just a few. Clear some space in your schedule, and on your shelves—you’re going to need it. Set 10,000 years before Frank Herbert’s Dune, Navigators of Dune wraps up the Great Schools of Dune trilogy, which is itself the prequel to the authors’ Legends of Dune trilogy. Co-author Brian Herbert is, of course, Frank Herbert’s son. The latest from the author of The Prestige is about a composer who lives in a fascist country that’s locked into a perpetual war—and the strange journey he takes while looking for his missing brother (including some drifts through time). This novella from Evenson (Last Days) runs just 96 pages. It’s about a character called X who may or may not be human, and who may or may not find the answers he seeks (an early online review describes it as “deliciously frustrating”). 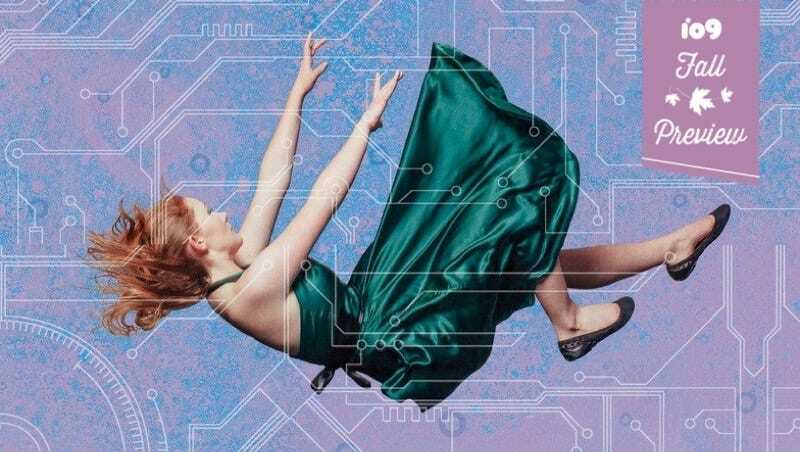 Wilde’s sequel to her Nebula Award-winning Updraft returns to that book’s city filled with towers made of growing bones, whose citizens use mechanical wings to fly wherever they need to go. There’s a new young hero this time: Naton, who uncovers surprising secrets as he tries to help the city rebuild. A biologically-enhanced human on an isolated planet fights government prejudice and invading aliens in this sequel to Hamilton’s The Abyss Beyond Dreams. Science and tech writer Gleick has investigated chaos, genius, speed, and information in his previous books—which makes his current topic, time travel, a perfect next step. This is not a novel; it’s more of a history and cultural study of how we perceive time travel, and how the concept has affected the way we view real time, too. The co-founder of io9, Charlie Jane Anders (All the Birds in the Sky), has a short story in this collection, which also features works by Salman Rushdie, Kelly Link, Ted Chiang, and more. Karen Joy Fowler (The Jane Austen Book Club) serves as guest editor. A pair of lovebirds who both work in tech decide to undergo a simple medical procedure to increase empathy between them. But things don’t quite work out as planned, and the woman in the equation finds herself connected to someone else entirely—in a way far beyond what she signed up for. An ageless magician fond of drinking beer and sleeping late visits New York City to visit old friends, only to find the city has changed in unexpected ways—and a supernatural war is brewing on its fringes. This tale about artificial humans follows a pair of young women whose stories eventually become intertwined. The design of the book matches the concept; once readers finish one tale, they can flip the book over and begin the new tale starting from the other cover. Translating the work of Cixin Liu is only a small part of much-lauded author Ken Liu’s literary output. This sequel to the very well-received “silkpunk epic fantasy” Grace of Kings promises more adventures and treachery in the island nation of Dara. It’s an especially good time to be an Atwood fan, between her graphic novel, Hulu’s upcoming Handmaid’s Tale adaptation, and novel Hag-Seed—the author’s fresh spin on Shakespeare’s The Tempest. If you’re a fan of Mel Brooks (who isn’t? ), this is gonna be a must. Judd Apatow wrote the forward; the book contains over 225 photos and presumably just as many juicy behind-the-scenes stories. We sure wish we could include a little something called The Winds of Winter on this list. But circumstances being what they are, this deluxe, illustrated first volume in GRRM’s A Song of Ice and Fire will have to do. This dystopian tale imagines a not-all-that-far-fetched future in which rich people are able to purchase special treatments that allow them to live forever. Twin Peaks returns to the airwaves next year, and David Lynch’s co-creator has written this novel to further fan the flames, promising a deeper examination of the tiny town’s history and its many deep and troubling mysteries. Every single Le Guin novella, collected in a single book for the first time—plus a new introduction by the iconic author. Moreno-Garcia (Signal to Noise) returns with another fantasy tale set in Mexico City. This time, the main character is a vampire who falls for the young man she’s earmarked as her next victim. A new novella set in the same world as the author’s epic fantasy The Sorcerer of the Wildeeps. Circa 1994, a group of scientists move into a series of glassed-in biomes, under close scrutiny of the media and the project’s creator, who has a bit of a God complex. Things soon go awry in this latest novel from the author of World’s End and The Road to Wellville. A gaggle of ne’er-do-wells plot global chaos in this new satire from the editor of the seminal Mirrorshades: The Cyberpunk Anthology. This is the prequel novel to that new stand-alone Star Wars movie you might have heard a thing or two about around these parts.